Debates about the AF method. Clarification of misunderstandings in the debate. Discussions about the global MPI in particular. Review of different research questions requiring further work. The list below is not comprehensive, but covers some of the key research issues that have been identified by OPHI researchers. 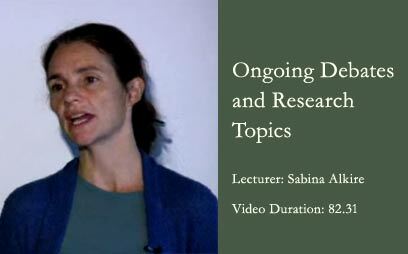 Please watch Part 2 of the video to get a further explanation by Sabina Alkire. Can we improve international data for MPI calculations? Should we ‘call for’ a survey having a specific set of dimensions and indicators? And which? Data Constraints: Most criticisms address these (why don’t you include _____?). Aggregation within households – what biases exist? Households without eligible populations – the impact on the measure? Which are the ideal indicators to use for an international MPI? Development of MPI-2 appropriate for countries with higher human development. Rural/Urban poverty? Should we adjust urban indicators? Statistical interrelationships among indicators – Systematic. Develop multidimensional health indicators, quality of schooling, governance, child poverty, etc. 38:20 Research issues 1: data constraints, the ideal data, surveys etc.